autism speaks. itâ&#x20AC;&#x2122;s time to listen. MODERN ADVANCES Sean Alquist, an architect from Michigan, is designing therapeutic structures for children with ASD. He is helping these individuals with their sense of touch, and how much for to apply to an object by creating tensile fabric that tests motor, auditory, and visual feedback. Magda Mostafa, and is currently designing centers all over the world for individuals with ASD. She created the ASPECTSS Design Index to help guide design decisions as well as â&#x20AC;&#x153;to score the autism appropriateness of a built environment post occupancy.4â&#x20AC;? In other words, Mostafa is doing research on how to design for individuals with ASD, and giving buildings a score out of 10 that identifies how well the building was designed around the needs of individuals with Autism. â&#x20AC;&#x153;The picture below is the advance school for developing skills of special needs children which is the first building worldwide to be designed using the sensory design theory aspectss design index.â&#x20AC;? 5 This was designed by magda mostafa. As you can see, there are many amazing advances in the world of architecture for individuals with ASD. however, there are still a lot of changes that need to be made. The objective was todesign with a purpose, to bring awareness to the autistic community and how important it is to increase the government funded budget of these incredible buildings. it is important to show how thoughtfully designed an autism center for elementary school children can really be, and how it can have a postive psychological impact on the children when within these spaces. The role of an Interior Designer is extremely important when it comes to projects such as an Autism Center. There are many different design choices that need to be made, and made with a purpose. Such as, you cannot design an Autism Center that has long corridors because the chance of a student running down the hall, or getting anxious when in a long stretch of space is a very common occurring problem these facilities have. It is also up to the Interior Designer to pick specific furniture and finishes that will not overwhelm their client, but instead work with the teachers and therapists to get their job of calming a student down, or not making them overly anxious and over stimulated. Today, designers are trying to use finishes and design choices that help the environment, not hinder it. Therefore, sustainability will be a factor that is brought into this project. However, it could be believed that this idea of sustainability will in the end help the users of this facility because it will feel like a cleaner, healthier, more breathable environment. Individuals with ASD are more aware, and more in touch with the environment around them, and by bringing in materials that are sustainable to the environment, the users will have a sense of a healthy environment which will have a calming effect. The client of this building will be the Autism center itself. Their mission is to deliever an environment to their students that make them feel comfortable, secure, and safe. Their overall goals will influence the designers in their choice of design decicions. The users of this building will be elementary school children, ages 5-11. Their needs will help guide the design of this project because they can be put at risk in a poorly designed facility. Socio Economic status as well as demographics will not play a role in this center, strictly for the fact that Autism does not discriminate against race, gender, or class. truly do. Medical centers have been around for hundreds of years, and date back as early as the 6th century . It is surprising to read information regarding these medical facilities, because much of the design they had back then, they still use a more modern version of those designs now. Take for example the rooms themselves, some of the earliest medical facilities had rooms that were about 13â&#x20AC;&#x2122;x13â&#x20AC;&#x2122; in dimension. of large open areas with hundreds of terrible ventilation, and dirty conditions. It is evident that there were many different types of medical centers, which we still see today.2 However, something that remains true today, the use of connection to outdoor space positively effects patients. Views of outdoor space positively effect the demeanor of individuals with ASD. Psychology, outdoor space makes individuals feel a sense of comfort and relaxation. not required to have education set up in place for individuals with ASD. “John F. Kennedy passed a law that made it possible for the state to be aided by the government to provide education for disabled children.”3 This is the time when individuals were viewed as more than having a disability. This is the time when education centers made the move to incorporate design that aided to individual’s with ASD needs. When it comes to site conditions, Autism centers are generally located in more suburban settings. This is because of the individualâ&#x20AC;&#x2122;s hypersensitivity to their surroundings. When put in settings with loud cars rushing by, sounds of horns, and thousands of people walking, this suddenly becomes very overwhelming for individuals with ASD. The idea of crossing busy streets, or getting lost in a city is enough to make individuals have a meltdown Therefore, most Autism Centers are in areas that are away from busy streets and located in the suburbs, away from city life. The surrounding area of quiet and nature helps the students calm down. Giving them sufficient outdoor space where they can have their therapy sessions, or outside class time puts them in a calmer state of mind. 1. “The History of Hospitals and Wards.” HCD Magazine. March 10,2010. Accessed August 31, 2017. http:// www.healthcaredesignmagzine.com/architecture/history-hospitals-and-wards/. 2. “The History of Hospitals and Wards.” HCD Magazine. March 10,2010. Accessed August 31, 2017. http:// www.healthcaredesignmagzine.com/architecture/history-hospitals-and-wards/. 3. Raiti, Author Christina. “Evolution of Autism in Public Schooling.” Educ 300 Education Reform Past and Present. Accessed August 31, 2017. http://commons. trincoll.edu/edreform/2014/04/evolution-of-autism-inpublic-schooling/. 4. “Architecture for Autism: Exterior Views.” ArchDaily. April 04, 2012. Accessed September 01, 2017. http://www. archdaily.com/223076/architecture-for-autism-exteriorviews. 5. Architecture for Autism: Exterior Views.” ArchDaily. April 04, 2012. Accessed September 01, 2017. http://www. archdaily.com/223076/architecture-for-autism-exteriorviews. 6. 6. “Architecture for Autism: Exterior Views.” ArchDaily. April 04, 2012. Accessed September 01, 2017. http://www. archdaily.com/223076/architecture-for-autism-exteriorviews. When walking into The Center for Autism, it was evident that this project was a mid to low construction budget. Many of the exisiting conditions from the previous medical center were kept, making the design choices of this Autism Center unjustified since it was geared more towards a hospital setting. There are three floors that make up this autism center. The basement level being more of a meeting area for employees, the ground floor more of evaluation rooms and therapy rooms, and then the top floor with more classroom space. This center is located in Philadelphia, in a very urban setting located near City Line Avenue. This center was placed in a residential neighborhood, making it look slightly out of place. The socio-economic conditions are mostly middle to low class. The design concept was to keep as much of the exisiting medical facility as possible. When looking at this building from the outside, as well as the inside, it feels as if youâ&#x20AC;&#x2122;re stepping into a medical facility. This is because the previous building was a hospital, therefore the designers and architects kept a lot of those preexisting conditions. The shape of the floor plan, as well as the finishes that were chosen are along the lines of a hospital design concept. Since the center is quickly running out of space for students, the organization of the floorplan lacks. There was no thought of expansion, therefore the center is forced to take away adjacencies of the floor plan so they can convert them into more evaluation rooms or therapy rooms. Since the adjacencies were being taken away, it was hard to navigate through the floor plan and understand what the floor was specifically used for. The wayfinding is also part of the design that lacks. It was very easy to get lost in this building because the rooms were not labed. There were not signs around the halls helping you navigate through the building. When it came to materials and finishes these decisions were better though out for the most part. When the walls did have color, they were very muted shades of blue or green in order to calm the students. The upholstery and carpet had minimal patterns on it which is helpful to prevent overstimulation. However, the hallways lacked contrast by using white laminate flooring with white walls. The overhead lighting was extremely bright, and in some rooms the use of floor lamps had to be used in order to be able to shut off the bright lights. The light choices also gave off a buzzing sound which irritates the students. points about door handles and door swings. They recommended having barn style doors in order to have a closed door but still access to view what is happening in that room. Also, offices downstairs had no access to outside views, which the employees said they did not like. They wish they had offices on higher floors with windows. Finally, the most important topic that was brought up was the usage of lighting. The employees of the building said they wish they had lighting that could be changed with a dial in order to accomodate the different sensitivites. with ASD feel walking around this building since they are more susceptible to confusion and frustration. Many employees mentioned the usage of lights, and how they wished there were different rooms that accommodated different levels of lights. They also wish they had control over air. Employees brought up a point about how having an overly cold or hot room can aggravate the students with ASD that are using these rooms. Therefore, having individual thermostats in each room would be helpful. The Kinney Center had recently been renovated in 2009 by a company called Flatiron Building Company. This highlevel construction budget was paid for by fundraisers and donations that the college held. This project is located on a college campus, however used for young children. Overall, this project was designed for young children, incorporating heavily contrasted colors and the use of patterns that would resognate well with children. This center is located in Philadelphia, placed in a quiet space on Saint Joseph Universityâ&#x20AC;&#x2122;s campus. This center is protected by a long road that has a security gate in order to get into the parking lot of this center. The center is located around Drexel Hill, which serves as a very high class setting. Therefore, the high budget was used to help the center blend in with the wealthier surrounding areas. Overall, the concept was to design a more modern, hypersensitive aware design for young children with Autism. Many of the design choices were made to accomodate children with Autism, and each of the decisions were appropriate. The concept was to keep more of the private office spaces in the back of the house, while the public Something that was surprising throughout this building is the use of heavy contrasted colors. There are many research articles talking about how heavily contrasted colors can irritate invididuals wtih ASD, however Danielle, the woman who provided the tour, said she does not typically notice that the deep reds, blues, and yellows effect the students, however she can see how they could with other students.. When in the office areas and circulation paths, more neutral colors were used with highly contrasting carpeting that distinctly showed the difference between the wall and the flooring. Most of the upholstery in the waiting and reception area had busy patterns on it, however the patterns were used in neutral and toned down colors. Lighting throughout this center was very well thought out, the architects chose a type of overhead light that could be dimmed, as well as a light that did not give off that small buzzing sound that individuals with ASD are hyperaware of. The floor plan of this building was well thought out, making it easy to find your way throughout the building. Appropriate adjacencies were placed near each other, which made navigating throughout the space not stressful since there was a sense of the area that you were walking through. Since this building is extremely small, there were no wayfinding signs. The post occupancy was slightly helpful with this buiding. It was only slightly helpful because most of the employees felt the same way I did about the building. It was a very well thought out, beautifully designed space. However, one aspect that the employees did not like was the use of glass throughout the building. The employees said that when students can see them through glass in a different room, the students become noticiably upset because they do not understand why their teachers are not in the same room as them. An aspect of the design that the employees appreciated was the different light types that were placed throughout the space. The employees said it is extremely helpful that they are able to control the level of brightness the rooms have, and they said this was helpful because all of their students have different sensitivity levels when it comes to lighting. Employees were also excited about hte security room that was placed in this facility because it gives them a chance to look over the children, but also allow the parents to come in and see the work that the teachers are accomplishing with their children. Overall, I think the design of this center was very appropriate and helped define the work that occurs in this center. The floorplan was laid out appropriately, and most of the finishes were also appropriate. However, the only thing that I would think of changing in this building would be the wayfinding. There was no wayfinding throughout this building, so for an outsider to come in I would have gotten lost if I was not following around an employee the entire time. Another thing that I would change would be the sensory room. This sensory room served as a meltdown space as well as a sensory room, which are two opposite types of rooms that should be separate. It was evident that they should be separate, because Danielle was explaining to me that during a meltdown, a student ripped down projectors that are used for sensory activities. If the two rooms were not added together, the meltdown room would have strictly soft surfaces and not expensive technology placed throughout like a sensory room has. It has been mentioned before that putting an autism center in the suburbs is more of an appropriate move because of the sensory issues individuals with ASD can experience in an urban setting. This autism center is located in the suburbs of Maine, surrounded by trees, grass, and very limited buildings. It is tucked away off of a main street, allowing for easy access into the building, but still tucked away enough that the students will not be distracted by the sound of cars rushing by. Although the architect does not talk much about the style of this project, it is mentioned how this facility was designed to look like a medical facility. â&#x20AC;&#x153;This outpatient clinic brings together all of the providers that a child might need in a medical home/team-based environment.â&#x20AC;?2 Looking through the images that the architecture firm provided, it is apparent that they wanted this to look like a medical facility. There was no carpeting that was used throughout this whole entire building, only white laminate floors were provided in every room. There was also small contrast between the white floors and the beige colored walls, making the space look extremely sterile and slightly depressing. The ceilings were typical 2x2 acoustical tiles with overhead lighting that emulated the type of lighting you would see in a medical facility. The classrooms have small amounts of furniture in them, making them look like they cannot hold many students in one room. Most of the classrooms only held a few desks with computers and a bookshelf placed in the room. There was absolutely no color added to the wall. Even the private office areas are poorly designed, practically only placing a table with a few chairs around a TV screen. Overall, I am very impressed by the layout of this building. Each room clearly had a function and stuck to that function unlike some of the other case studies that were looked at. The rooms were laid out in a way that was easy to maneuver for an outsider. There were no long corridors, which would help the individuals with ASD because they commonly feel overwhelmed in long hallways. Adjacencies also helped the design of the building, placing rooms that needed to be close together within the same hallway. Although I liked the floor plan of this building, I did not like the finish choices that they chose. Within this building, I felt like I was in a hospital. This is a common issue with Interior Design when it comes to Autism, and I do not think that this is necessary. I felt like the students were there to get treatment, not to get education and therapy sessions. Therefore, I would have added more color and material choices that contrasted the different rooms. I would not add in so much laminate floors everywhere, and possibly add in carpet or a soft toned wood. Overall, it looks like more work went into the floor plan than the design, so I would hope that if this architecture firm took another shot at this project they would try to focus more on the interior design aspect. 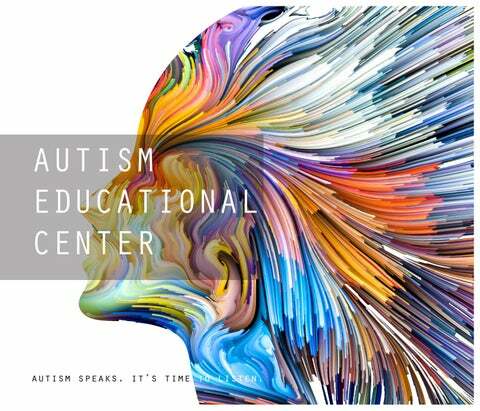 The Center for Autism and Developing Brain located at 21 Bloomingdale Road, White Plains, NY 10605. Overall, this building is designed to work with individuals with Autism and other developmental disorders.1 This project was 19,500 sf in total and designed by DaSilva Architects. This project was a $3.2 million dollar budget project that was completed in 2013. 2 Overall, this project was completed in a way that worked with the services that this company has to offer. The overall floorplan is extremely symmetrical, supporting the facts about individuals with ASD who get lost and confused within floorplans that are symmetrical and linear. The design of this building did not try to compete with the services, instead it was harmonious with the services and design. The setting for this type of work is one of the most important aspects of an Autism center. It is important to locate the center away from any busy roads, particularly roads within the city. is The Center for Autism and Developing Brain has a wonderful located in a secluded part of the suburbs. This building is located off of a residential road, surrounded by many trees and acres of land. This building is tucked away from any major roads that are within this area, therefore creating a serene and peaceful setting for the individuals with ASD. “Although DaSilva never design for autistic children, principle Jacques Black tells me they worked to convert a ramshackle gymnasium into a comfortable environment for autistic kids by paying close attention to texture, acoustics, and lighting conditions.3” The design concept of this project was not only to create a comfortable space, but make the children feel as if they are in a story. This entire building is designed to have animated-like features, such as artificial ceiling tiles in the shape of clouds and skies, as well as creating little “huts and houses” within the building. There are some spaces throughout this building that also connect you to the outdoors, putting in benching throughout the building as well as gardens and green spaces to mimic the concept of a park. The use of lighting in the project quickly became an important aspect of the design. This became an important aspect of the design due to the individual’s hypersensitivity to light. The architecture firm focused on using as much of the existing building as possible, which included large gymnasium windows that they could use to their natural light advantage. They were able to use the windows to their advantage instead of distraction points because they were “six feet off the ground, therefore gave the children a gentle feeling of the outdoors without actually exposing them to what’s happening outside.”4 The usage of lights that were dimmable were also an important aspect to the lighting design because it gave the employees an opportunity to adjust the lighting depending on the students they are working with at the time. This center used a majority of different colors, however the usage of the colors they chose were muted down tones. For example, many of the walls were painted blue and green, however instead of using bright, vibrant choices of the blues and greens, they chosen a duller tone instead of a brighter one. The usage of light toned woods also came into the design choices, creating a lighter atmosphere for the individuals with ASD. There was a lot of usage with natural materials such as wood, cork, rubber, and porcelain. “This gave a happy medium to the two extreme ends of ASD.”5 The usage of carpet instead of linoleum also looks to be a design choice that the designers decided to use. evaluation Overall, I was extremely impressed with the design of this building. I felt as if all of the design choices were very well thought out and were determined to fit the needs of the users of the buildings, and not determined to fit an aestetically pleasing guideline. The finishes and furniture that were chosen also fit the overall design of the building and did not feel out of place. I thought that the floor plan was laid out in a way that would be easy to navigate when walking throughout the building. As someone who has never stepped foot inside this building, I now want to go visit this site. The adjacencies, as you can see in the colored floor plan, made the area cohesive and easy to walk through, having rooms that needed to be close to each other within the same overall area. 1.“The Center for Autism and Developmental Disorders.” E4H Architecture is a healthcare architecture firm. Accessed September 21, 2017. http:www.e4harchitecture.com/portfolio/mental_health/67The_Center_for_Autism_and_Developmental_Disorders 2.“The Center for Autism and Developmental Disorders.” E4H Architecture is a healthcare architecture firm. Accessed September 21, 2017. http:www.e4harchitecture.com/portfolio/mental_health/67The_Center_for_Autism_and_Developmental_Disorders 3.”Center for Autism and the Developing Brain.” Megan Meyers, AIA. Accessed September 29, 2017. http://meyersarch.com/center-for-autism-and-the-developing-brain/. 4 .Brownlee, John. “How To Design For Autism.” Co.Design. May 02, 2017. Accessed September 29, 2017. https://www. fastcodesign.com/3054103/how-to-design-for-autism. 5.Brownlee, John. “How To Design For Autism.” Co.Design. May 02, 2017. Accessed September 29, 2017. https://www. fastcodesign.com/3054103/how-to-design-for-autism. When it comes to Interior Design, it is important to understand the type of building you are designing and what type of individuals will be entering the space. Designing a space that fits the needs of your users will increase comfortability as well as positive visual feedback. However, it is even more important to design appropriately for the needs of the individuals with ASD sice they are more in tune with their environment compared to individuals without ASD. Nowadays, we tend to overlook design for Autism because we do not understand the types of environments that are appropriate for them. “Individuals with Autism Spectrum Disorder are part of a growing population that is usually ignored in design. The needs of those with ASD are excluded entirely from all building codes and design guidelines.”1 Individuals with ASD crave an environment that is easily adaptable. “Individuals with ASD tend to over overwhelmed in spaces they cannot adapt to, causing negative behavior.”2 Our knowledge of design for Autism begins with the basics: qualitative and technical research. range of design methods.Some of the most important ergonomic aspects to consider are reach as well as posture. It is important to incorporate comfortable seating that will influence good posture for the students as well as staff within these buildings. They will be using seating during therapy and classroom time, so potentially spending a lot of time sitting down. Specifying seating that can shape to the user of the chair will effect ergonomics in a positive way. barriersshould be implemented anywhere that this clerances is not met. When it comes to individuals in wheelchairs, forward reach can only be 48 inches maximum with a minimum space of 15 inches off the floor. Another important aspect is level change. Any change of level between 1/4inch and Â˝ inch high needs to be leveled with a slope no steeper than 1:2. Also, handrails must be added on ramp runs as well on stairways. They need to be provided on both sides of the stair/ramp. â&#x20AC;&#x153;A maximum height of 28 inches measured to the top of the gripping surface from the ram surface or stair nosing is recommended.â&#x20AC;?12 Turning space needs to be no smaller than 60 inches for wheelchairs to make the full spin. When it comes to hallways, corridors should be no smaller than 5 feet in width. 1. Gaines, Kristi. Designing for autism spectrum disorders. Andover: Routledge Ltd., 2016. 2. Gaines, Kristi. Designing for autism spectrum disorders. Andover: Routledge Ltd., 2016. 3. Gaines, Kristi. Designing for autism spectrum disorders. Andover: Routledge Ltd., 2016. 4. Gaines, Kristi. Designing for autism spectrum disorders. Andover: Routledge Ltd., 2016. 5. Gaines, Kristi. Designing for autism spectrum disorders. Andover: Routledge Ltd., 2016. 6. Gaines, Kristi. Designing for autism spectrum disorders. Andover: Routledge Ltd., 2016. 7. Gaines, Kristi. Designing for autism spectrum disorders. Andover: Routledge Ltd., 2016. 8. Gaines, Kristi. Designing for autism spectrum disorders. Andover: Routledge Ltd., 2016. 9. Gaines, Kristi. Designing for autism spectrum disorders. Andover: Routledge Ltd., 2016. 10. Gaines, Kristi. Designing for autism spectrum disorders. Andover: Routledge Ltd., 2016. 11. Guidelines for design and construction of health care facilities. Chicago, IL: ASHE (American Society for Healthcare Engineering of the American Hospital Association), 2010. 12. Guidelines for design and construction of health care facilities. Chicago, IL: ASHE (American Society for Healthcare Engineering of the American Hospital Association), 2010. When it comes to Interior Design, individuals do not realize the effect a design of a space can have on them mentally and physically. Most people think that designers will pick design features that look nice, completely disregarding intesive research that the designer did to come to their final design conclusions about how their design will make people react. There is a reason why designers design the way that they do, and it is to instill positive feelings in the users that will make an impression. They want individuals to feel a certain way within their space, and that is why researching human centered design, light and color, and connection to outdoor space is important. Human centered design is described amazingly by the published book, â&#x20AC;&#x153;Designing for Autism Spectrum Disorders.â&#x20AC;? This book contains real life case studies that work well with Autism design, and why the users of the building feel comfortable and at ease in those spaces. When it comes to psychology, Interior Design is a creative way of design that can positively affect someoneâ&#x20AC;&#x2122;s thoughts and emotions. However, this is even more true when it comes to individuals with ASD since they are more in tune with their emotions and environment. In order to design for someone psychologically, you need to understand them and their needs. It is important to understand that with individuals with ASD, they are more prone to negative emotions and over stimulation. Therefore, being careful with design choices is important so they do not get frustrated in the spaces they are in, ending in negative emotions. something to take into consideration, most individuals have a hard time when it comes to social interaction. They get overly anxious and very uncomfortable when put in situations with many people surrounding them, or just one individual they may not know. Therefore, it is important to design break out spaces where the individuals with ASD can go to be alone, and have quiet time to themselves. Most designers design for human interaction, but because of the stress it can cause for individuals on the spectrum, designers need to limit the use of interaction within their design. Possibly creating small nooks throughout the space would be a good idea to give the individuals with ASD spaces they can easily access when starting to get socially over stiumlated or too stressed. “Consider designing a room students can claim as their own, it gives them a sense of authority and significance in a space.”1 Human behavior is something that should be taken into consideration for all interior design projects. However, it is even more crucial for individuals with ASD because their sensitivity or lack thereof. Therefore, taking into consideration specific design choices for acoustical, autditorial, and visual privacy spaces will have “the biggest impact on individuals with ASD.”2 Another aspect that could be important when it comes to human behavior is designing a sensory overload room that the individuals with ASD could retreat to when they are overstimulated, but also give teachers an opportunity to keep an eye on them. These rooms could be filled with calming effects such as soft music, soft lighting, and comfort pillows. Also, incorporating sensory objects to enhance stimulation for those who are under stiumulated would be helpful in order to make those individuals feel more comoftable within a space. These examples of different design choices are ones that designers would typically not make in a space that is not designed for Autism, therefore it is imperative to implement these ideas correctly within a space to help individuals with ASD feel safe and calm. As touched on earlier in this book, many individuals with ASD experience either hypersensitivity or hyposensitivity to light. Some individuals wtih avoid light all together because it is too painful, while others are unable to see the presense of sunlight. Since the individuals can have a hard time experience light due to pain or lack of sight, it is important to design a space that can change to fit the needs of these different sensitivities. â&#x20AC;&#x153;Lighting is one of the most important components of design and one of the factors that most greatly influences how a space will be perceived.â&#x20AC;?3 In this Autism center, it is going to be extremely important to have a mixture of artificial and natural light and to consider control when implementing these ideas. Natural light is going to be important in this desiign because the repetitive use of artifical light could increase stress and discomfort, and also effect the performance of the students within the space. However, the use of too many windows could also be a distraction for the students. Therefore, being careful with the use of natural light will be essential. Either placing windows high enough that students cannot see out them, or having window treatments that can block the view outside, but still be transparent enough to let in light. Artifical light is also important to incorporate within a space, but using flourescent lighting can cause flicker with the light and poor behaviors within the students. This flicker can cause many physicological issues such as headaches and eye strain.4 However, there are different light types that you can choose to not see this flickering or hear the buzzing sounds given off by the fixtures. Choosing LED sources instead of flourescent fixtures can help productivity and concentration. However, choosing the right light bulb is not where the control should stop. It is important to include light dimmers wtihin the space to adapt to certain individuals that are perceiving the space. By creating an outdoor garden for individuals with ASD to use, it can positively influence their mood because they can then start to tend for the garden and start to use their hands. By exercising hand muscles, individuals with ASD will feel productive and like their time is being put to productive, good use. Having more hands-on work for the students will provide them with tactile support that can help the students feel as if they have a better understanding of the environment around them and what it takes to keep it alive. However, it is going to be imperative that just like the interior spaces, the garden also gets a lot of thought when it comes to different plans that will be used. The individuals with ASD will still have the same sensitivity to the texture of plans the way that they do to textures within the building. If not thought out properly, this will cause many breakdowns and stress that will start to upset the individual as well as individuals around the upset student. Wayfinding should also be taken into consideration. Showing the student where different plants are within the garden will help them become familiar with their surroundings, making them feel comfortable within this garden. 1. Gaines, Kristi. Designing for autism spectrum disorders. Andover: Routledge Ltd., 2016. 2. Gaines, Kristi. Designing for autism spectrum disorders. Andover: Routledge Ltd., 2016. 3. Gaines, Kristi. Designing for autism spectrum disorders. Andover: Routledge Ltd., 2016. 4. Gaines, Kristi. Designing for autism spectrum disorders. Andover: Routledge Ltd., 2016. 5. Gaines, Kristi. Designing for autism spectrum disorders. Andover: Routledge Ltd., 2016. 6. Gaines, Kristi. Designing for autism spectrum disorders. Andover: Routledge Ltd., 2016. 7. Color Psychology: How Colors Impact Moods, Feelings and Behaviors. “How Does Orange Make You Feel?” Verywell. Accessed October 21, 2017. https://www.verywell.com/ the-color-psychology-of-orange-2795818. 8. Color Psychology: How Colors Impact Moods, Feelings and Behaviors. “How Does Orange Make You Feel?” Verywell. Accessed October 21, 2017. https://www.verywell.com/ the-color-psychology-of-orange-2795818. After researching psychology within Autism design, it became apparent that the site that is chosen for this project also needs to make the users feel safe and secure the way the design does. Therefore, the site that is chosen in this project is 6 Herndon Avenue, located in Annapolis Maryland. The reasoning behind why this building was chosen was because of the site, location, as well as the building shape. 6 Herndon Avenue is located in a residential area within Annapolis, sitting on the coast of the Chesapeake Bay. It is a quiet, secluded location which will give the individuals within this space an oasis to retreat to in order to feel safe and calm. This town that is adjacent to the Chesapeake Bay is a quaint, small town that embodies many of the characteristics of a smaller township. The architecture around the Chesapeake Bay resembles old, colonial type architecture to enhance the concept of a small-town ambiance. The site of this building is in a secluded area, away from the business that a town can bring. It is pulled away from any roads so the sounds of cars and horns will not affect the children within the facility. The sophistication of this town will influence the center to have the same type of sophisticated design, as well as incorporating natural materials and colors that beach towns and colonial architecture usually embody. Located near the Chesapeake Bay, the town of Annapolis, Maryland is heavily focused around using the water for trade and industries. This is very much so a town that relies heavily on the resources of the bay in order to bring in profit as well as tourism. It is a fairly small town, making up about 39,000 people out of almost 6 million people that live in the state of Maryland.1 The median age within this area is about 39, therefore this area is prone to a lot of families with younger children. Since the demographics will mostly bring in small children within the community, this area will benefit from having an Autism center that caters to younger children since about one in sixty eight children are diagnosed with Autism. This building is located right off of Herndon Drive, further down a private road that leads to the entrance of this facility. The surrounding area of this site holds many residential neighborhoods, and only one other commercial building, which is a pool shop, within a few miles of this site. Most of the houses that are in this surrounding area are two level, family homes. The most outstanding feature of this site is going to be the views to the Chesapeake Bay. The site lands right on the coast, therefore having accesses to the beach in the back of the building. There are no obstructed views of this bay, creating beautiful scenery and secureness around the building. Since this building is surrounded by many residential homes, it would make sense for this building to emulate much of the residential feel. Although this site was an old factory, the interior of this building should take into consideration the colors that are found around this area as well as incorporating similar materials that are used on the surrounding homes. 1. Demographics | Annapolis, MD. Accessed November 03, 2017. https://www.annapolis.gov/875/Demographics. 2. “Annapolis, Maryland (MD) Poverty Rate DataInformation about poor and low income residents.” Annapolis, Maryland (MD) poverty rate data - information about poor and low income residents living in this city. Accessed November 03, 2017. http://www.city-data.com/poverty/povertyAnnapolis-Maryland.html. 3. “Annapolis, Maryland (MD) Poverty Rate DataInformation about poor and low income residents.” Annapolis, Maryland (MD) poverty rate data - information about poor and low income residents living in this city. Accessed November 03, 2017. http://www.city-data.com/poverty/povertyAnnapolis-Maryland.html. Since this building is LEED certified, the concept of this building was to stick with natural materiality throughout the building, and apply it in a modern but nature-like way. The overall concept of the exterior of this building was to use the natural wood, but mix it together with a more industrial type of architecture by also using steel. This type of architecture was carefully chosen to relate to different buildings found around Annapolis and the industrial type buildings that you would find next to trade and fishing towns. The structural systems used within this building are columns, as well as truss and beams running throughout the second floor. Long span trusses were used in the areas where columns were not implemented. This building was finished with glazing on the exterior, with the natural wood being incorporated as framework for the glass. This environmental building was the first building in the world to be LEED Platinum Certified. Since this is a LEED certified building, many reused finishes were used throughout. Natural wood as well as reused concrete flooring was used throughout the interior, as well as the wood on the exterior. On the interior cork, bamboo, and linoleum were also recycled products that were used. Other recycled materials on the exterior is the steel on the siding of the building, as well as the roofing. This building also offers opportunites when it comes to catching rainwater with the three rainwater catchment systems that are incorporated and the compositing toilet systems. Solar panels and a ground source heat pump system are other sustainable features of this building. 1. â&#x20AC;&#x153;1.3 Codes and Standards.â&#x20AC;? Home. August 13, 2017. Accessed November 17, 2017. https://www.gsa.gov/node/81625. Over the course of this book, a great deal of information has been introduced and discussed after researching Autism design. Overall, when it comes to Interior Design it is important to understand the users of the building, and how the design can make those users feel comfortable within a space. Therefore, when it comes to designing for Autism, many psychological aspects needs to be taken into account when it comes to the design process. Some may be things that are typical in interior design, but others may be design implementations that are not usually taken into account. Some things such as sensory rooms, long corridors, and color psychology are going to be three important parts of the design process in order to design for the users. In the end, after all the research that has been conducted, I feel as if I understand what needs to be implemented for children with Autism to feel comfortable within their space. In relation to this I think that all of the design decisions will need to be carefully chosen and well thought out. When it comes to designing for Autism, many design decisions that usually would not need great attention will now be imperative to concentrate on. In result of choosing decisions carefully, the individuals with ASD will feel more secure and safe. Interior Design for Autism is an aspect of design that is not very well researched mostly because of the little amount of awareness that is brought to Autism. However, the research that I did find that regarded Autism and design was extraordinarily helpful as well as insightful. Researching through different books and no just internet sources was a main reason as to why the research on this topic was successful. I think that after the amount of worthy research that was done on this topic, I will be able to fill in gaps that I may not have thought about without the research. Without this research, I would not have been able to understand different design choices such as acoustical, visual, and auditory design choices for individuals wtih ASD. These aspects are always heavily focused on, but little things such as ceiling heights, corridor depths, and colors are not heavily touched on, especailly when Autism is taken into account. Conceptually wise, I think that this project needs to take on the role of transforming a childrenâ&#x20AC;&#x2122;s center into osmething that it has never been before. I want to make this project exciting and insightful for what could be, therefore I do not want to design an Autism center that loos like a typical medical institute or school. I want it to be a space that makes the children feel good., not like an outsider. Individuals with Autism are such a special part of our society, however in the world we live in today they are constantly seen as the odd ones out because they are not seen as â&#x20AC;&#x153;normalâ&#x20AC;? to many. However, individuals who see Autism like that are wrong. It is time to start bringing awareness to Autism and understanding that ASD does not make someone any lesser of a person than others. I wanted my final capstone project to mean something to me. I wanted my capstone project to make a difference in someoneâ&#x20AC;&#x2122;s life, and I think that by giving an Autism center a beautifully, well-thought out design then we could stop making the children feel alienated from society. We could make them feel more confident in their skin by giving them the design resources they most likely do not have available to them now. Zach “Autism Spectrum Disorder.” Dictionary.com. Accessed September 02, 2017. http://www.dictionary. com/browse/autism-specturm-disorder?s=t. Mortice, Zach. “Architecture for Autism Could Be a Breakthough for Autisistic Kids.” Redshift. December 09,2016. Accessed August 27, 2017. https://www.autodesk.com/redshift/architecture-for-autism/. Mortice, Zach. “Architecture for Autism Could Be a Breakthough for Autisistic Kids.” Redshift. December 09,2016. Accessed August 27, 2017. https://www.autodesk.com/redshift/architecture-for-autism/. An Interview with Magda Mostafa: Pioneer in Autism Design.” ArchDaily. October 08,2013. Accessed August 27,2017. http://www.archdaily.com/435982/an-interview-with-magda-mostafa-pioneer-in-autism-design. “ An Interview with Magda Mostafa: Pioneer in Autism Design.” ArchDaily. October 08,2013. Accessed August 27,2017. http://www.archdaily.com/435982/an-interview-with-magda-mostafa-pioneer-in-autism-design. “An Interview with Magda Mostafa: Pioneer in Autism Design.” ArchDaily. October 08,2013. Accessed August 27,2017. http://www.archdaily.com/435982/an-interview-with-magda-mostafa-pioneer-in-autism-design. “Financial Assistance.” Autism Speaks. July 24, 2012. Accessed August 27, 2017. https://www.autismspeaks. org/family-services/community-connections/financial-assistance “The History of Hospitals and Wards.” HCD Magazine. March 10,2010. Accessed August 31, 2017. http://www. healthcaredesignmagzine.com/architecture/history-hospitals-and-wards/. “The History of Hospitals and Wards.” HCD Magazine. March 10,2010. Accessed August 31, 2017. http://www. healthcaredesignmagzine.com/architecture/history-hospitals-and-wards/. Raiti, Author Christina. “Evolution of Autism in Public Schooling.” Educ 300 Education Reform Past and Present. Accessed August 31, 2017. http://commons.trincoll.edu/edreform/2014/04/evolution-of-autism-inpublic-schooling/. “Architecture for Autism: Exterior Views.” ArchDaily. April 04, 2012. Accessed September 01, 2017. http:// www.archdaily.com/223076/architecture-for-autism-exterior-views. Architecture for Autism: Exterior Views.” ArchDaily. April 04, 2012. Accessed September 01, 2017. http:// www.archdaily.com/223076/architecture-for-autism-exterior-views. 6. “Architecture for Autism: Exterior Views.” ArchDaily. April 04, 2012. Accessed September 01, 2017. http:// www.archdaily.com/223076/architecture-for-autism-exterior-views. “The Center for Autism and Developmental Disorders.” E4H Architecture is a healthcare architecture firm. Ac Brownlee, John. “How To Design For Autism.” Co.Design. May 02, 2017. Accessed September 29, 2017. https://www. fastcodesign.com/3054103/how-to-design-for-autism. Brownlee, John. “How To Design For Autism.” Co.Design. May 02, 2017. Accessed September 29, 2017. https://www. fastcodesign.com/3054103/how-to-design-for-autism. Gaines, Kristi. Designing for autism spectrum disorders. Andover: Routledge Ltd., 2016. Guidelines for design and construction of health care facilities. Chicago, IL: ASHE (American Society for Healthcare Engineering of the American Hospital Association), 2010. Guidelines for design and construction of health care facilities. Chicago, IL: ASHE (American Society for Healthcare Engineering of the American Hospital Association), 2010. Color Psychology: How Colors Impact Moods, Feelings and Behaviors. “How Does Orange Make You Feel?” Verywell. Accessed October 21, 2017. https://www.verywell.com/the-color-psychology-of-orange-2795818. Demographics | Annapolis, MD. Accessed November 03, 2017. https://www.annapolis.gov/875/Demographics. “Annapolis, Maryland (MD) Poverty Rate DataInformation about poor and low income residents.” Annapolis, Maryland (MD) poverty rate data - information about poor and low income residents living in this city. Accessed November 03, 2017. http://www.city-data.com/poverty/poverty-Annapolis-Maryland.html. “Annapolis, Maryland (MD) Poverty Rate DataInformation about poor and low income residents.” Annapolis, Maryland (MD) poverty rate data - information about poor and low income residents living in this city. Accessed November 03, 2017. http://www.city-data.com/poverty/poverty-Annapolis-Maryland.html. “1.3 Codes and Standards.” Home. August 13, 2017. Accessed November 17, 2017. https://www.gsa.gov/node/81625. my life than I will ever be and understanding of those and you all deserve nothing strong. You all are the best. Mom. Thank you for introducing me to this wonderful community and all it has to offer. The work you do for a living goes unnoticed to some, but to many you are their hero. You are my hero. You are your studentâ&#x20AC;&#x2122;s hero. You change lives, and are the definition of superwoman. You continue to make peopleâ&#x20AC;&#x2122;s lives easier without expecting anything in return, and because of that I will always look up to you. Your student and I love you up to heaven and back.